A lot of soldering is what is called through hole soldering. For this project we needed to do some freehand or free style soldering. 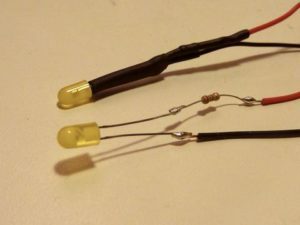 For this project we needed to solder a resistor and longer leads onto an led. We started by turning on the soldering iron so it could warm up while we did other things. We then cut the wires to the correct length and then stripped maybe ½ inch or less off the ends. Then we bent the ends into a hook shape and connected them. When soldering this we put the part being soldered over a small wooden block so as not to burn the table. So we made two hooks, connected them, then soldered them and went on to make the next set of hooks. We ended up with six hook shapes and 3 places per led that needed to be soldered. After soldering we used heat shrink tubing to cover up the solder joints. Below you can see what was soldered and then the soldering all covered up with heat shrink. Note we heat shrinked each wire individually before covering both wire in heat shrink together.